Last week I released a brand new free pattern,,, September Jewel Super Scarf!! A lovely, slightly wavy extra-large scarf… Perfect for this years fashion statements!! I had 1 skein left of they beautiful yarn I used, Red Heart Boutique Gleam in Canyon… What else would I do but make another project to match!! I absolutely love the way this hat turned out… the wavy stitching made an awesome effect for this slouchy hat… So easy and fast to make and only one skein of yarn!! Round 8: Ch 3, dc in next 5 sts, *ch 2, sc in next sc, ch 3, sk (ch1,picot,ch1), sc in next sc , ch 2, dc in next 6 sts*, repeat * to * 3 more times, ch 2, sc in next sc, ch 3, sk (ch1,picot,ch1), sc in next sc, ch 2, join with sl st in top of beginning ch 3. Finish off leaving a long tail for finishing off the top of the hat. Using a yarn needle, weave the yarn in and out of each st in the top of the last round. Draw closed and secure the yarn. Using the tail of round 1, sew bottom of hat together where you began. Congratulations!!! 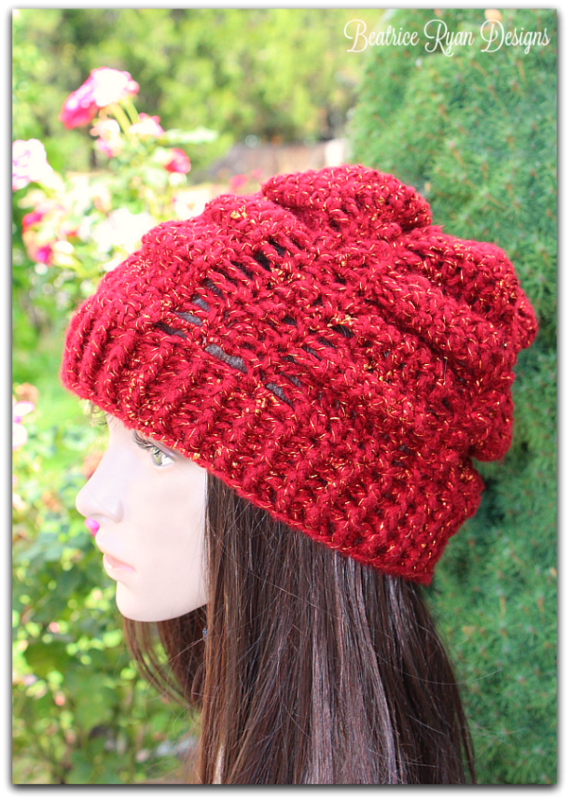 You now have a September Jewel Slouchy Hat… Great job!! September Jewel Super Scarf… New Free Crochet Pattern! !